Popular in both Chinese and Indian cuisine these chicken lollipops are a frenched chicken winglet. Matched with KNORR Sakims Teriyaki Sauce, they are full of flavour and easy to eat. Combine KNORR Japanese Teriyaki Sauce GF, garlic, lemon juice, oil and pepper in a non-metallic bowl. Add chicken lollipops and toss to coat. Cover and refrigerate for 2 hours. Drain chicken from the marinade and wipe bones clean so they don't burn when cooking. Bake at 180C for 30-40 minutes or until cooked through and slightly sticky. 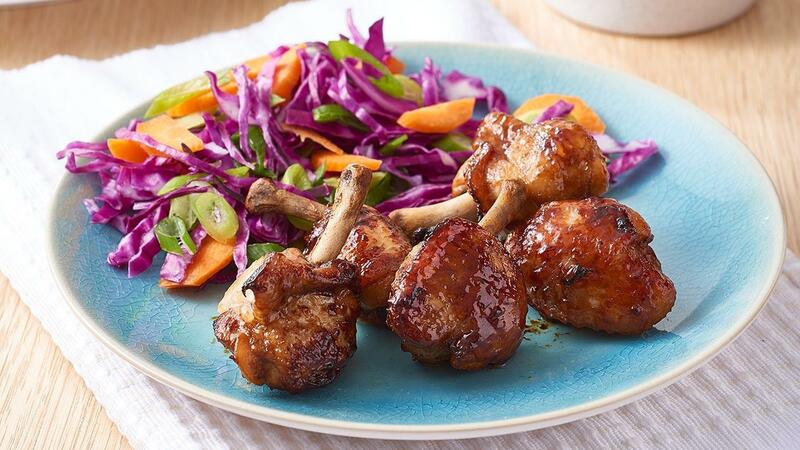 Serve with KNORR Sakims Thai Sweet Chilli Sauce, Asian style slaw or steamed vegetables.